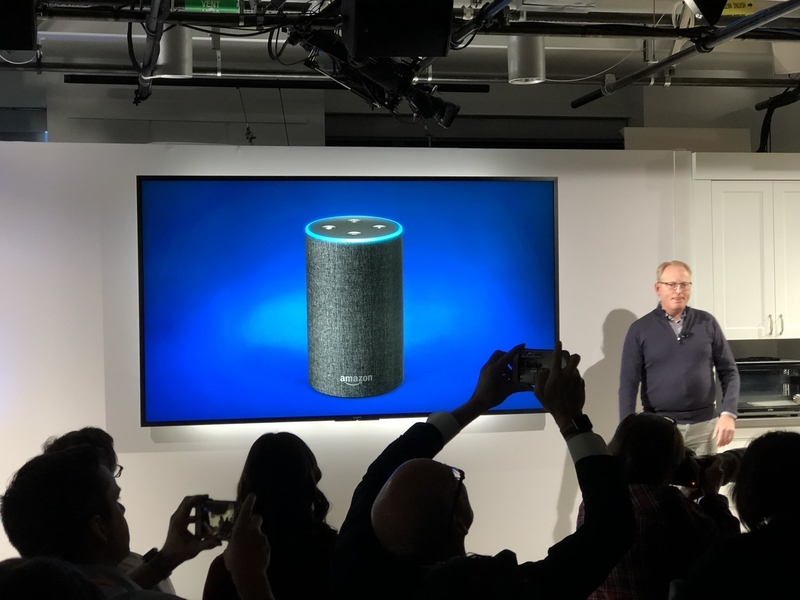 Amazon announced a small army of new Echo devices and services at a press conference today in Seattle. 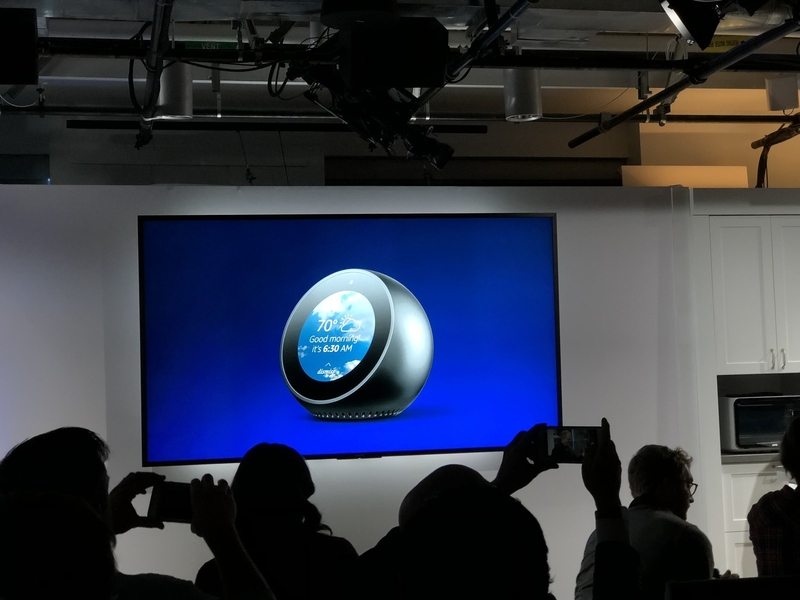 Amazon held an unannounced press event today, where it rolled out a slew of new Alexa-enabled devices: There is an all-new Echo along with the Echo Plus, Echo Spot, Echo Buttons, Echo Connect, and a new Fire TV. Several of these come with bundled pricing. 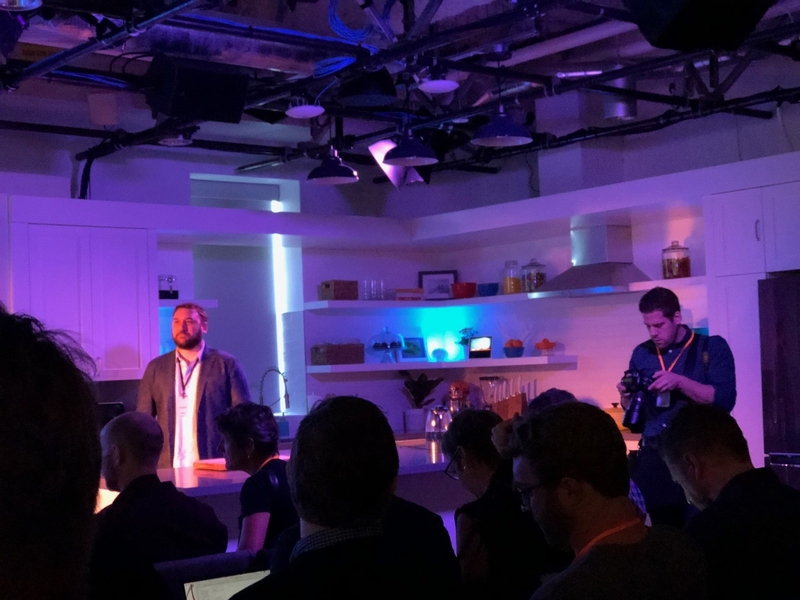 It also announced a deal with BMW to put Alexa in those vehicles, new international availability, and a ton of new features — from international calling to a greatly enhanced ability to control smart home devices. Here are all the most important updates. Is Alexa hitting on me??? We weren't able to talk to Alexa on the Spot, but got a sense of what Alexa messaging, flash briefings, and different clock faces look like. It will cost $130 and deliver in December in the US, and UK and Germany early next year. It can play videos, show different clock faces, and display essentially anything Echo Show can (including security camera feeds and video flash briefings). Amazon's Echo with a built-in screen is going international. Flash briefings, lyrics support, and smart home camera capabilities will all be included. There will be localized skills as well, like Sky Sports. Pricing is £199 in the UK, and €219 in Germany. There is a £100 and €100 discount if you purchase two of them (because Amazon wants you to use it to make video calls). 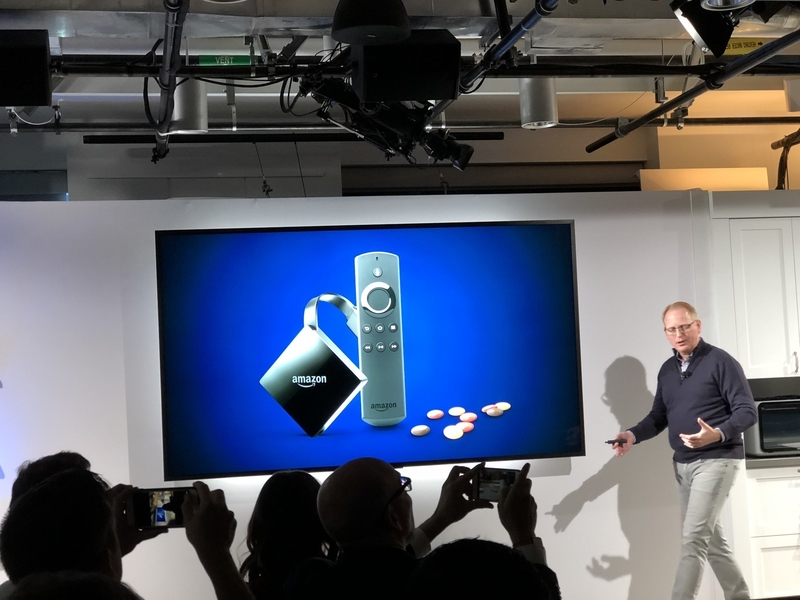 Amazon announced that tens of millions of Fire TV devices have been sold and said it is the #1 streaming media player in the US, UK, Japan, and Germany. 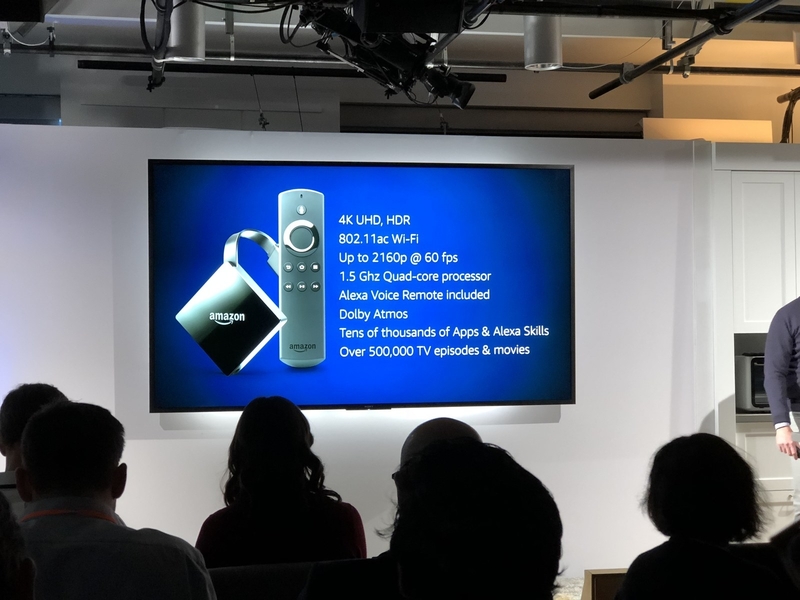 The new Fire TV with 4K and HDR/UHD support, as well as Dolby Atmos support, rivals the just-released Apple TV 4K. 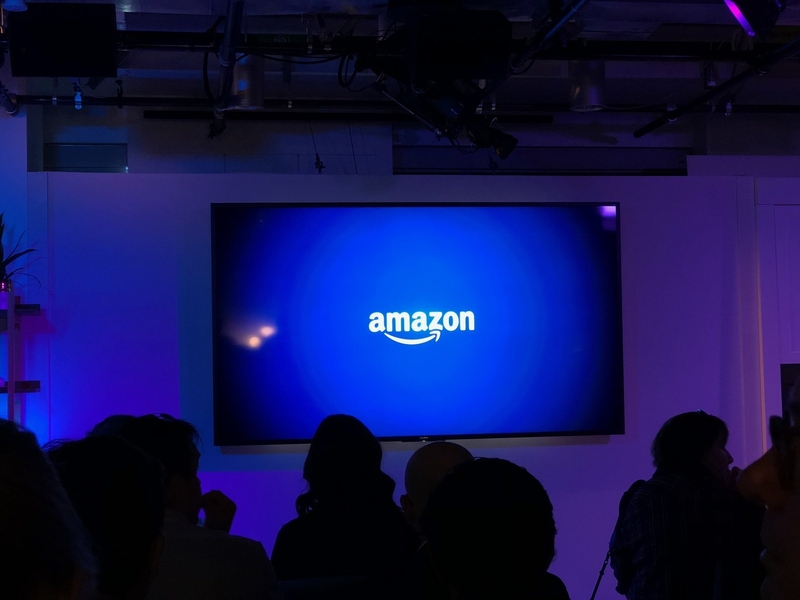 You can now ask Alexa to play content through Fire TV ("Alexa, play Ray Donovan"), and Fire TV will start the show or movie where you've left off. You can also play channels: "Alexa, play Food Network," or "Alexa, go to Fox Sports One," which will take you to the appropriate channel on Hulu. The Alexa integration on Fire TV is fully compatible with Hulu, PlayStation Vue, NBC, CBS, Showtime, CNBC, Bravo, Netflix, NBC, and Dish Network. You can also get the Dot and Fire TV Stick for $60. 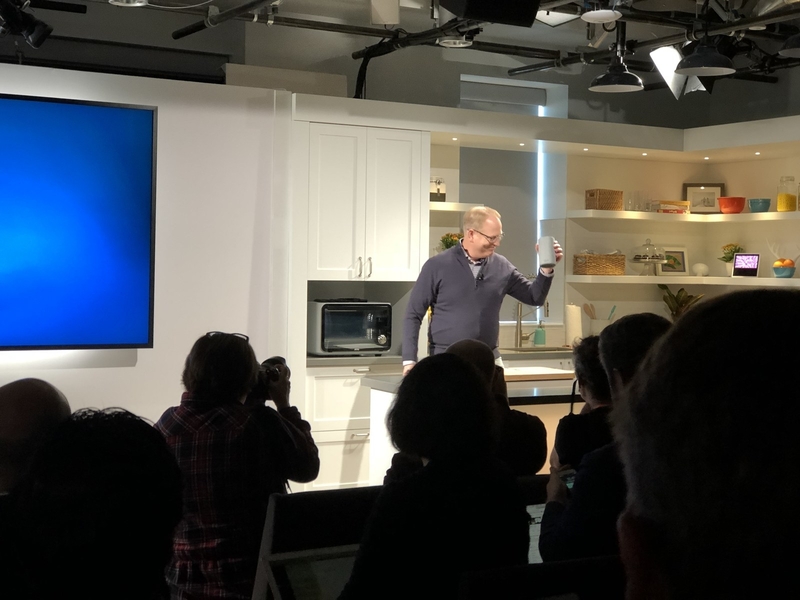 Amazon's Dave Limp introduced three new features designed to enhance Alexa. Implicit targeting will let people group clusters of smart home devices with a specific Alexa device. This means that instead of having to say, "Turn on the living room lights," for example, you could say, "Turn on the lights" to an Alexa device in the living room associated with those lights, and have everything come on. A "state" function will let Alexa know and relay to users the current state of a smart home device, such as an automated door lock, and change it on command. But the wow feature is "routines." 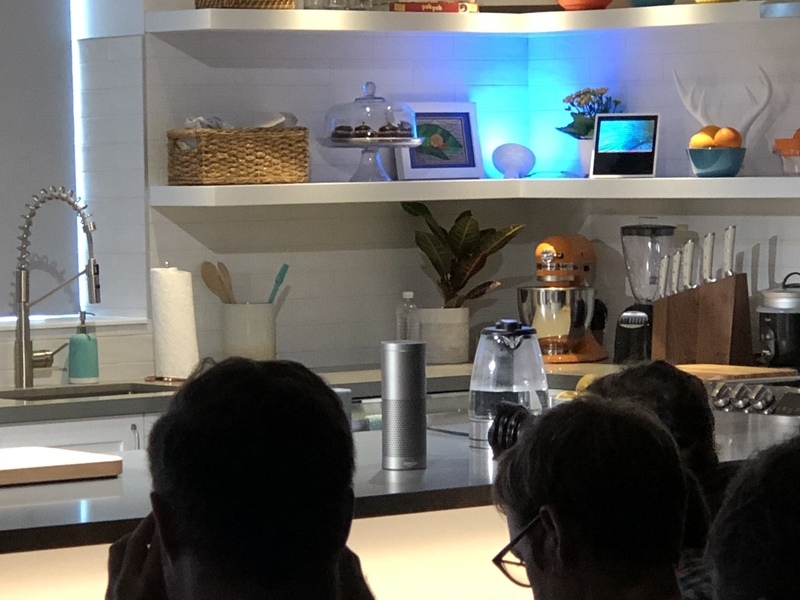 In a demo, Limp showed it off by saying, "Alexa, good morning," after which the lights in the room came on, the shades went up, the Echo began reading traffic and weather, and a tea kettle came on — all in sequence. The new device, which looks like the original Echo speaker, is designed to make setup for smart home devices easy. You can simply say, "Alexa, discover devices." Over 100 different devices (including lights and locks) are compatible with Echo Plus. Each Echo Plus will come with one Philips Hue smart bulb. 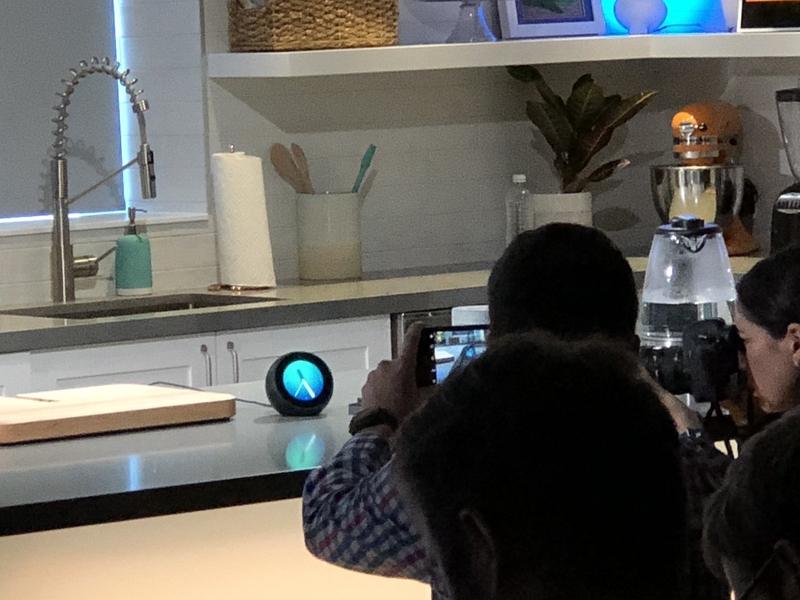 There's a new $20 Echo Button that Amazon says will "bring back family game night"
The device uses Amazon's new Alexa Gadgets API to connect to an Echo via Bluetooth. Players each have a button that will let them play games like trivia or three-card Monte. Hasbro is bringing a version of Trivial Pursuit and other games, according to Limp. The Echo Button comes in a two pack and is priced at $20. 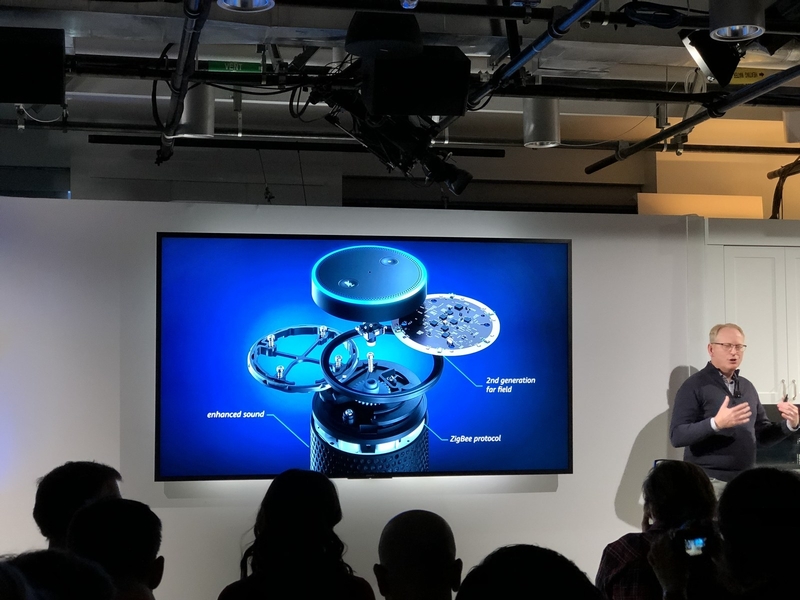 Amazon says the Gadgets API will let developers do things like build in beat detection, Bluetooth, lip-synching, motors, notifications, and sounds to devices that can be run via Alexa. Alexa has been in vehicles for about six months already, but today Amazon announced that it's coming to BMW. Thom Brenner, from BMW, said it will be in BMW and select Mini vehicles starting in 2018. It will let people use Alexa commands and skills in the car. It will cost $35 and ship next year. The device allows you to make calls through Alexa's calling service with your home number, bypassing the need for a landline. Voice calling and text messaging via Echo devices and the Alexa app will be available in the UK and Germany. Alexa will also be able to call phone numbers in the US. The main features of the new Echo seem to be mostly about audio performance. It has a dedicated woofer and tweeter and Integrated Dolby sound. It has a second-generation voice recognition technology. It will be available starting today for $99, £89 in the UK, and €89 in Germany. There will also be a discounted three-pack. 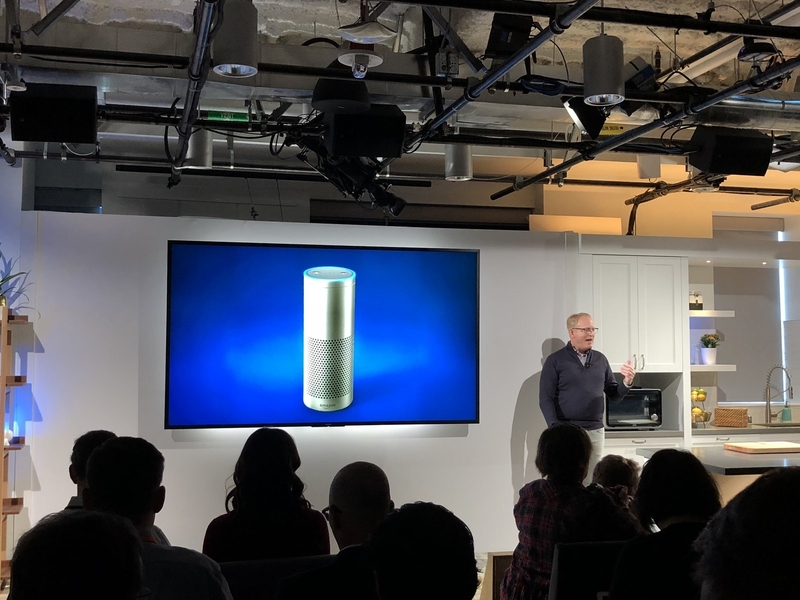 Alexa Voice Services VP Dave Limp took to the stage: "Alexa is bringing music back to the home." According to Limp, timers and alarms continue to be the main use case for Echo. We're queued up on the 29th floor of Amazon's big Day One headquarters building in downtown Seattle. Although Amazon hasn't made any official announcements, it is brutally obvious that there's going to be an Alexa- and Echo-oriented event. 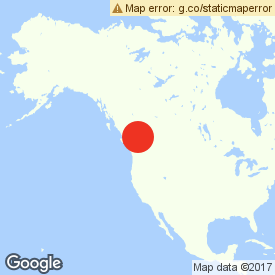 As if there weren't enough evidence: There are all sorts of Alexa-enabled devices spread out here. These are dev kits for 4 and 7 far-field microphone arrays that let Alexa hear you. We're on the scene at Amazon's Day One building (right beside its, er... Spheres). Based on the schedule, the event itself will be a 90-minute affair — which indicates there are probably several announcements to be made.